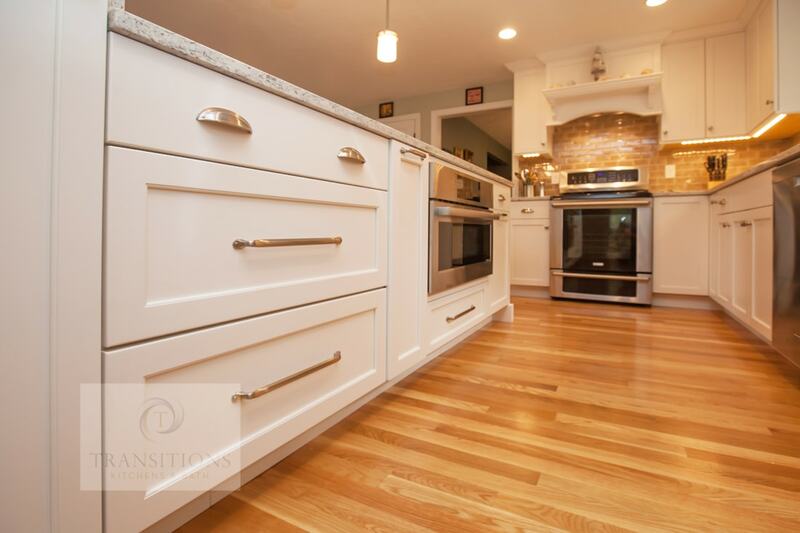 There are endless ways to add personality to your kitchen remodel. You can inject your own style with colors, materials and art, but lighting is one of the best ways to make a statement. Good lighting sets the scene and adds drama, luxury, and ambience. 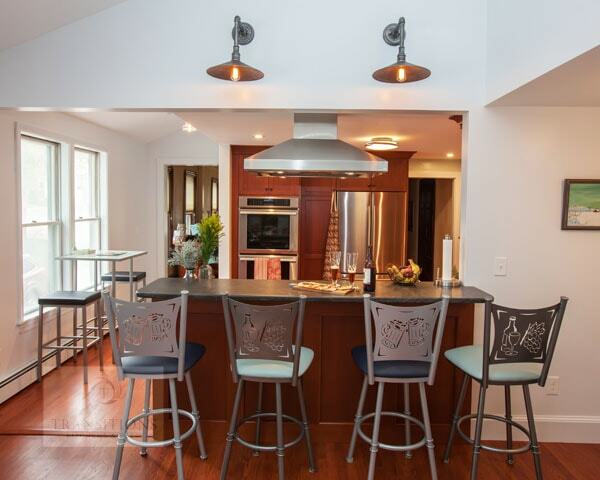 The impressive array of lighting fixtures available might even influence your choice of kitchen design. Once you’ve chosen your recessed, under-cabinet and display lighting, it’s time to branch out and go for bold fixtures in any color or texture. Lighting suspended from the ceiling immediately catches the eye and can define the room’s style while providing good task lighting. No matter how dramatic your choice, you can change it in the future so it’s a perfect low-risk investment. 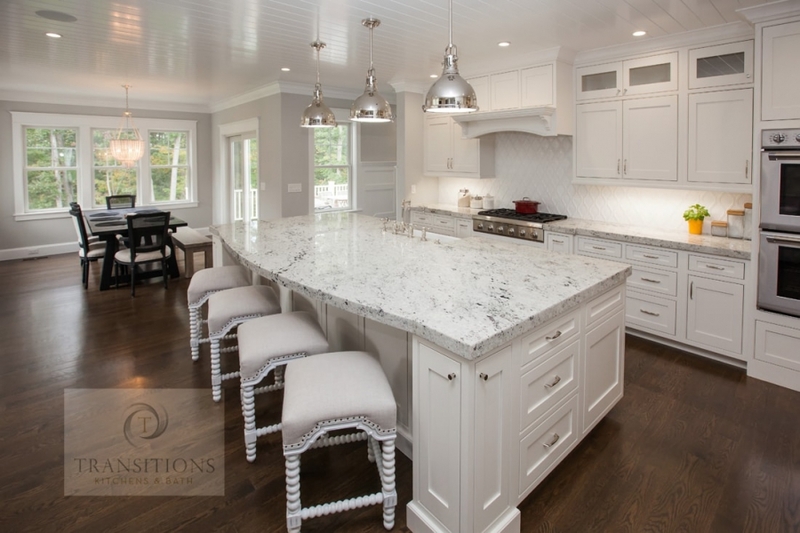 Hang multiple pendants over an island to really make a statement. 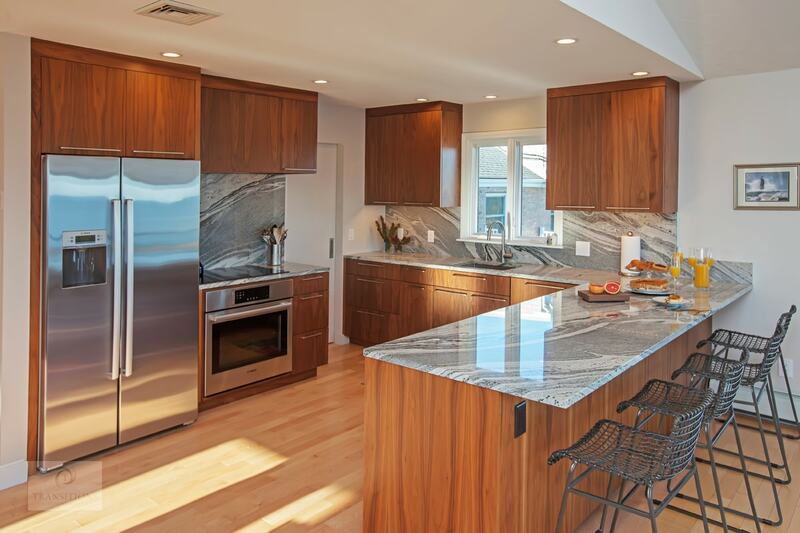 These shiny chrome pendants in a Norwell kitchen remodel pick up the metallic accents in the room, especially the countertop’s silver streaks. Oversized pendants add drama when suspended over a dining table or replace everyday recessed lighting with small pendants to accessorize your kitchen design like jewelry. Three- light pendants look sleek but make sure if you have an older home that your ceiling is even, or they will appear lopsided! 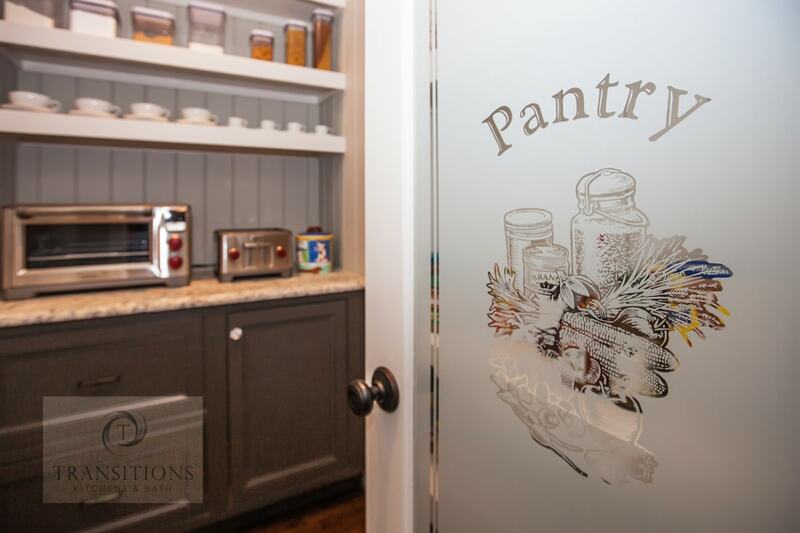 Try clear or colored glass or any material in a pendant that picks up accents in your kitchen design. 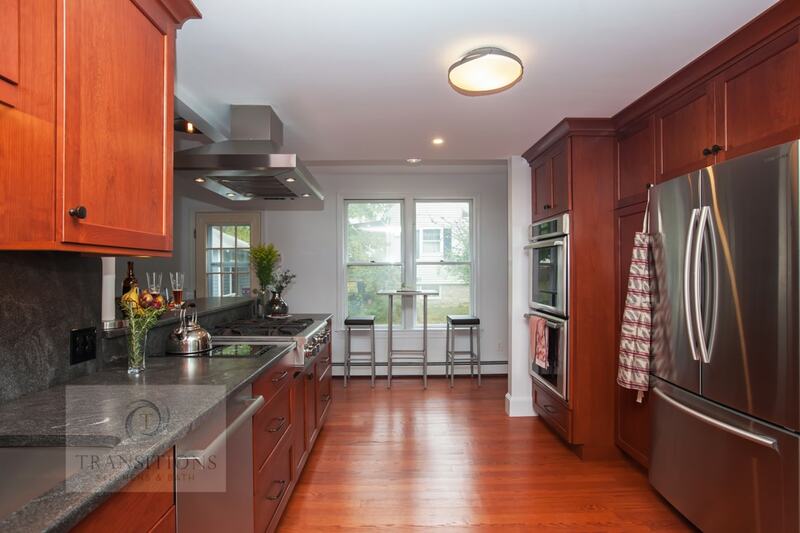 These glass globes really steal the show in this kitchen design in Hanover. Drum shades make a bold statement without overwhelming your kitchen design. 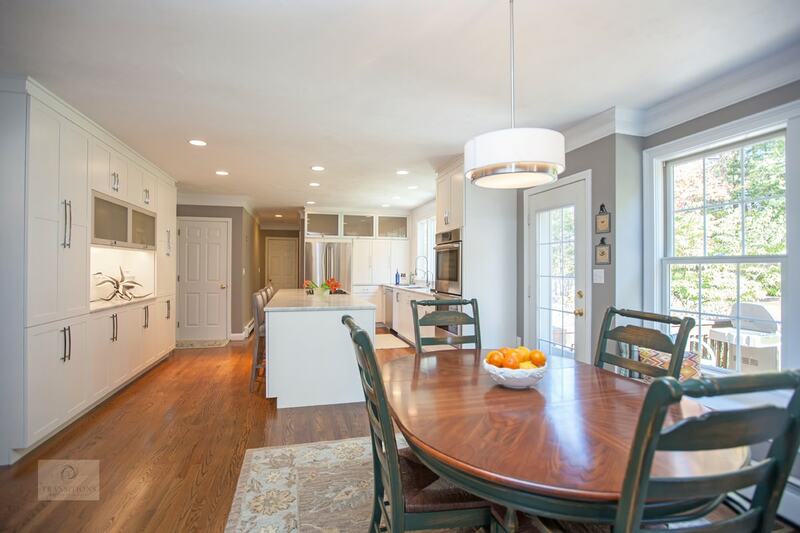 They are simple but provide an elegant focal point in any dining area such as this stunning drum light in a contemporary kitchen remodel in Marshfield. Kitchen sconces don’t have to be boring. They are available in a wide range of sizes, styles, and colors, with metallic accents, shades, and much more. Check out these black and copper sconces cleverly set over a peninsula in Weymouth. 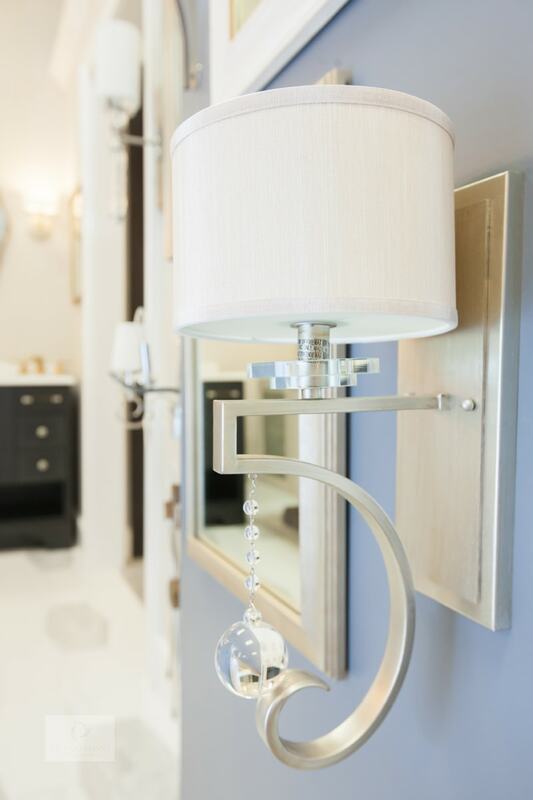 Our Norwell, MA showroom is full of lighting choices to give you inspiration, like this unique wall sconce. Chandeliers come in different shapes and sizes, but all are set to wow with their timeless glamor. They draw the eye automatically and are an excellent way to focus on one area or serve as a center point between a kitchen and living area. Contrasting styles too create an eclectic vibe and make your lighting really stand out. 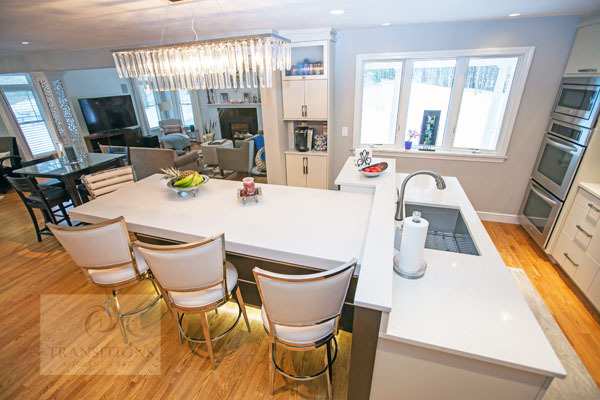 This chandelier adds sparkle to a sleek, contemporary kitchen design in South Hanover. Tube bulbs are ideal for larger kitchens as their generous length lets them light up bigger areas. Likewise, track lighting will give you multiple fixtures to angle in different directions. Where you position these long light fixtures is key as they add brightness and attract attention with their size. Exposed bulbs in clear or amber glass gives a vintage charm to your kitchen design, but otherwise make sure the shade will hide a regular bulb. 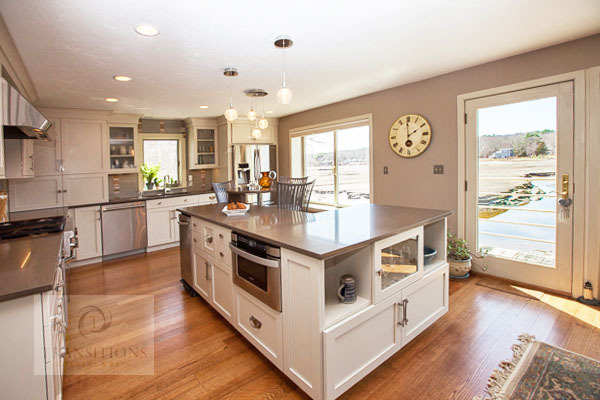 The main thing to note is that lighting focal points should be appropriate for the size of your kitchen. Bold doesn’t always have to be big, as we see here with these delicate pendants in Macomber making a huge impact. With holiday season just around the corner, why not add cheer with festive lights? 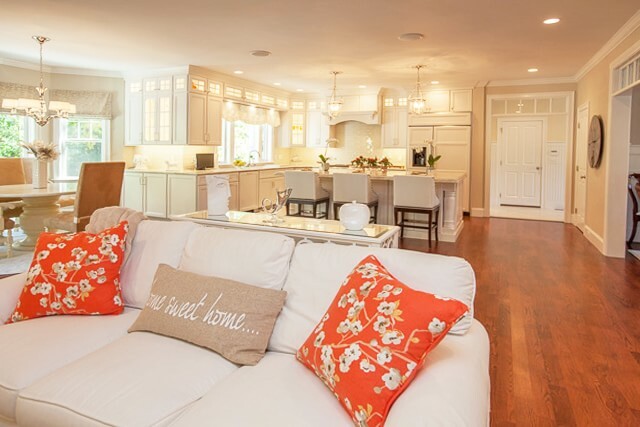 Candles, strings of bulbs and lanterns all add warmth and festivity to your kitchen design. Start with the all-important jack-o-lantern for Halloween! Combine any of these options with a dimmer switch or automated lighting controls to be able to set the mood for any occasion at the push of a button. 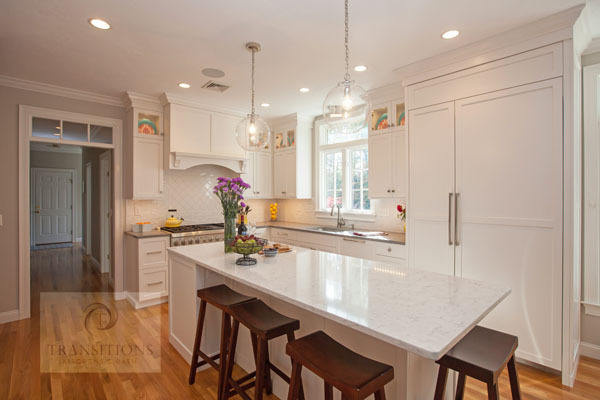 Click here to explore lighting ideas in our kitchen design gallery or contact us today and be illuminated by our lighting options.